Ironback Hideout Cellar is a cellar located underneath the ruined house at Ironback Hideout. It can be accessed via a trapdoor hidden within a tent, although this entrance is initially locked. Night Hunter: Claim the belongings of a Haafingar vampire hunter. 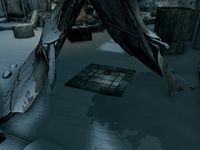 Once you have obtained the Ironback Hideout Cellar Key as part of the related quest, you will be directed to enter the cellar. Within, you will find an uncluttered entrance area containing an anvil. The deceased Orc Kragrash used the basement to store his vampire hunting equipment, which is separated from you by a set of bars. The cellar key can be used to unlock the barred door and access these items. 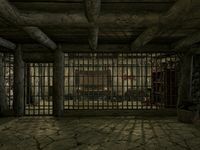 Behind the bars you will find a good deal of loot, including a treasure chest and a wall-mounted silver greatsword. Laid out on a table you will find an ebony crossbow, an Elven crossbow, and several Exploding Dwarven Bolts of Fire and Shock. These crossbow items can usually only be crafted. This page was last modified on 22 January 2019, at 22:13.